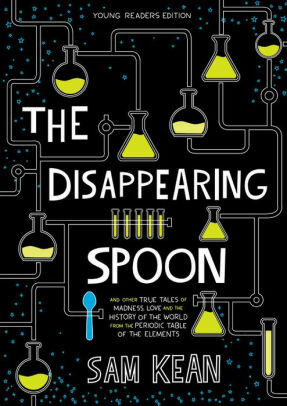 “The Disappearing Spoon” is one mystery solved by the periodic table, in this entertaining grab-bag of historical oddities from chemistry. The Disappearing Spoon (Young Readers Edition) by Sam Kean. Little, Brown, 2018, 212 pages plus appendix. [I]t’s one of the few things we know of that’s literally universal—something that even alien life forms would understand. But the periodic table of the elements is a very human thing as well, a treasure trove of all our passions and obsessions. And I’m constantly amazed at all we’ve managed to pack in there. As you might gather, the approach is not systematic—I could have used a little more of a refresher on basic atomic structure and chemical bonding, rather than picking up those concepts on the fly, but the historical tidbits maintain interest even when comprehension flags. The author finds in that orderly chart of elements the very stuff of disorderly life: “We eat and breathe the periodic table; people bet and lose huge sums on it; philosophers use it to probe the meaning of science; it poisons people, it spawns wars.” And it makes for some entertaining and informative reading—who would have thought? The appendix includes glossary, index, and a two-page spread of the periodic table for quick reference. You beat me to this review, Janie ;-). I am thoroughly enjoying this book.